Mission of every business is to devote all of its energies to the production of tangible or intangible objects that are high in quality and competitive in cost, meet customers’ expectations for performance, and are delivered in a timely manner. Finding and achieving the appropriate balance among these attributes—quality, cost, performance, and time to market—challenge all businesses. Those companies that are successful in meeting that challenge remain in business; those that are not usually disappear. An objects (Tangible/intangible) production environment that is perhaps changing more rapidly now than during the Industrial Revolution, competing successfully will require that businesses increasingly provide customers with shorter times between order and delivery and between product conceptualization and realization, greater product customization, and higher product quality and performance, while meeting more stringent environmental/market constraints. Accomplishing these goals will require major changes in current industry practices; such changes include the use of new and/or more complex technologies, greater use of information to reduce waste and defects, and more flexible business styles. A million dollar question rests, what can be done to effective face these challenges? Now with this answer, one may innovate in specific core business processes and/or innovate in support processes which can substantially impact overall performance of business. Innovation in specific core business processes goes hand in hand with basic engineering and science progression which has got its own pace. One can invest and wait till such innovation to happen where results may not be in control of decision maker. Smart business owner may keep an eye on this progress of core engineering area with appropriate investment but will also empower his business by adopting something which is cutting edge, latest and ever fast growing area which can substantially change the game and prove as an differentiator in the market i.e. Information Technology! Over a decade it has been proven fact that information Technology is the only dimension of modern industry which can wonderfully impact on progress of every part of industry processes giving tremendous benefits to early adopters. All of above key objectives can be addressed by judicious use of Information Technology. Q. What? Information Technology has been part of every industry from at least a decade? What has changed recently? Well, it is fact that IT has been playing critical role in business growth, but it is also fact that yesterday’s technology was inefficient in solving all the problems that industry has been facing. IT, being the fastest growing technology industry, solution has been found and realized which can take care of all of above business challenges in cost effective manner. Yes, this is about Cloud Computing which is now a reality, a new era of computing. The development and implementation of new information technology to meet these goals will be shaped by organizational, managerial, and human resource concerns that may prevent businesses from exploiting fully the technology that exists today. Sensitivity to these concerns will be essential to the successful development and implementation of the information technology associated with visions of industry for this century. This paper outlines how Cloud Computing techniques under Information technology, a wing of your organization can empower your business in driving your business goals and meeting challenges effectively. Q. Ok, let me understand how Cloud Computing will impact my existing way of working and Information Technology wing of my business? In a typical business environment, things may not be so simple or smooth going always. So many external factors impact on business and you need to provision that flexibility and agility in your enterprise to sustain those changes. For e.g. one decision by Olympic committee on dropping wrestling from 2020 Olympics can result significant impact on businesses directly or indirectly related to this game. Will those businesses be able to stand through such an impact had they invested all they can in IT capital investment? Let us take an example of Pizza Shop owner, who accepts Pizza orders over phone and using his web based system running on his owned IT resources which can serve 100 customers placing orders at the same time. What will happen during Christmas period or holiday season when 500 customers trying to place orders. Predictable, he will lose his business. Now, should he buy IT resources worth sustaining 700 customers placing orders concurrently in anticipation? If he does that, he his investing too much for short period of year for peak load being over optimistic assuming that there will not be any new Pizza shop opening in due course as a competitor. 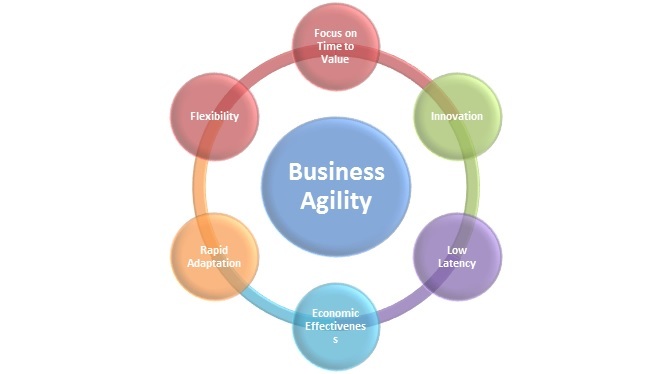 To solve this problem, a typical business should be agile in all possible scenarios, and should adopt technology which enables required business agility. Understanding the need of IT, Now Pizza Shop owner invests in IT to grow his business and believes in powerful IT to add more channels for online sale. Ultimately, he provisions high power software and hardware resources along with skilled labor to manage IT related activities including procurement, maintenance, backups, Servers, licenses, load balancing mechanisms, disaster recovery, failover mechanism, antivirus tools etc. As a result of his investment in IT resources including human resources, he is forced to spend his time to manage these things and take decisions as an owner of business. One day, he feels he needs a good manager who will manage all these things. He ends up spending more for IT manager who will manage IT and human resources. Over a short period, he found out that, his business is getting impacted because of ever increasing IT expenses resulting because of technology changes, licenses getting expired, maintenance expenses going higher, employee attrition rate and foremost his personal time spent on IT related activities which defocused him from core business innovation and customer interactions. “A Pizza shop owner should never defocus himself from innovating new Pizzas and talking to customers. He should never become IT expert with huge upfront investment in terms of money and time” – Cloud computing allows him to do so. Even after investing so much in IT, Availability of IT resources all the time is a challenge along with Performance which users love when it comes to online business applications. Just to summarize with above few examples, Cloud computing can benefit businesses with various aspects like lower capital expenditures, maintaining good ratio of CapEx vs. OpeEx, time to market, agility, elasticity, scalability allowing you to focus on core business and not on IT integrities. Now, after analyzing importance of IT in business and importance of Cloud computing in IT, let us understand some scenarios where Cloud computing can be leveraged. Q. As I know there are many cloud vendors, which one should we consider for understanding and discussion purpose? We will consider Microsoft Windows Azure cloud Platform for the discussions which is complete cloud platform, when needed we will refer about other cloud platforms. Q. Why do you think Microsoft Windows Azure can help me in my IT better way? Let me understand the Economics first! To talk about economics we need to compare apple with apple, which might not be the exact case when you compare on-premise data center with Cloud deployed data center. Still we will try to do fair comparison of your on-premise data center running an application in various situations. To start with lets us understand Pricing method of Windows Azure platform. Free usage – Try your idea and then pay for it! Windows Azure provides some resources free for use. This free quota can be used for setting Run up to 10 Web Sites per sub-region for free in a multi-tenant environment. Seamlessly upgrade to a paid Shared multi-tenant or reserved instance model as your traffic grows. The Pay-as-You-Go pricing option is extremely flexible. It involves no up-front costs and no long-term commitment. You pay only for the resources that you use each month. Make a monthly commitment to Windows Azure for 6 or 12 months and receive a significant discount. The discount you earn is determined by the monthly monetary amount you commit. Win additional 2.5% discount if you prepay your entire commitment amount upfront. Below table shows discounts and their upper limits. If your computing demands are excessive, one can contact Microsoft and talk on those. Microsoft is continuously inventing new ways of maintaining their data centers at reduced cost effectively so that same benefit can be provided to customers, as a result Microsoft has reduced Azure pricing many times. There are basically three modes for using Windows Azure resources. Some of the Azure resources are free in limited form. Such types of resources can be used when you are low in resource/traffic demand or you want to try an idea and till that time want not getting paid. Even smaller web sites intended for small duration such as product launch sites with less longevity can be hosted here. Can you please mention which of the Services/resources are free? Websites, mobile services, scheduled jobs are free in limited form along with some amount of storage, bandwidth are free. 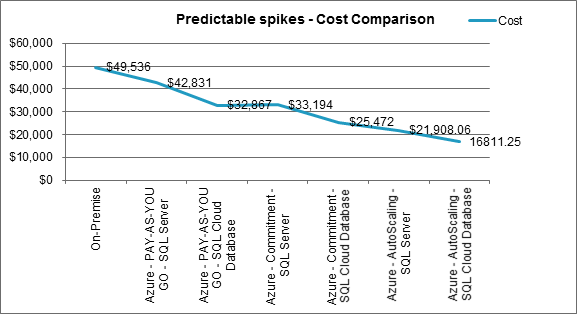 Please refer http://www.windowsazure.com/en-us/pricing/details/ for more details. In this mode, one can use resources in shared mode along with other applications on the same instances. This is cost effective way of hosting your applications to start with, once your idea shines or are convinced about outcomes, you can go for reserved or dedicated instances for your application. Reserved instances are only for you and will be dedicated for your application. You still are not locked with specific number of instances; you are in complete control of removing or adding instances to your application deployments. Since you control resources available for your application, you are in control of giving better performance and throughput to your users. Before we move on to deal with economics let us try to understand the different application usage patterns/scenarios, enterprises have been dealing with these scenarios with crude way because of lack of innovative options available. Let us now understand how different web application usage patterns can leverage cloud computing for cost effectiveness and added advantages. These are the applications having less longevity. Such applications live small life because of the intention of their existence is any occasion spanning for few days or few months. They may be used again after some duration in on-off pattern periodically but never constantly. Resource requirements of such applications may be low, medium or high, to fulfill the resource requirement, enterprises face challenges in provisioning resources which are required for small duration causing budgets to increase because enterprise has to ensure every part of data center ready for anticipated load, there is always rush in provisioning Servers, network hardware, system software, database software’s, storage systems, load balancing/failover mechanisms and last but not least human resources need in managing all these. Usually it has been found that to serve such kind of business request will cause total cost of ownership to go considerably high. Again these resources cannot be used in other initiatives because of periodic use of that which blocks them for same purpose decreasing utilization. Since industry had no option to opt any cost effective option other than traditional way, this results in high expenses, resources being underutilized after the period, inconvenience to stake holders and impact of possible customer dissatisfaction along with risks of losing business or impact on the business goal may result. In below given sample scenario, we are launching an internet facing web site which will be used for 6 months period at a time. This 6 months usage is needed with a gap of 6 months. For deploying this application in on-premise environment, architect of this solution has suggested to have 2 web servers in load balanced manner and 1 Database server. Because load on this application cannot be correctly known, IT has to provision all three servers for complete 6 months period. Considering traffic pattern is unknown, to sustain traffic for 6 months, all servers are provisioned for from day one till last day. This results in wastage of resources. If we use Windows Azure Cloud platform for hosting this application, Actual Azure VMs can be provisioned and de-provisioned in response to on-going traffic as shown below graph which will result in cost saving, better user experience by providing required resources to application when absolutely needed. Where as with cloud adoption, you don’t need to allocate all 3 servers for 18 months, we can just provision servers in minutes when needed. 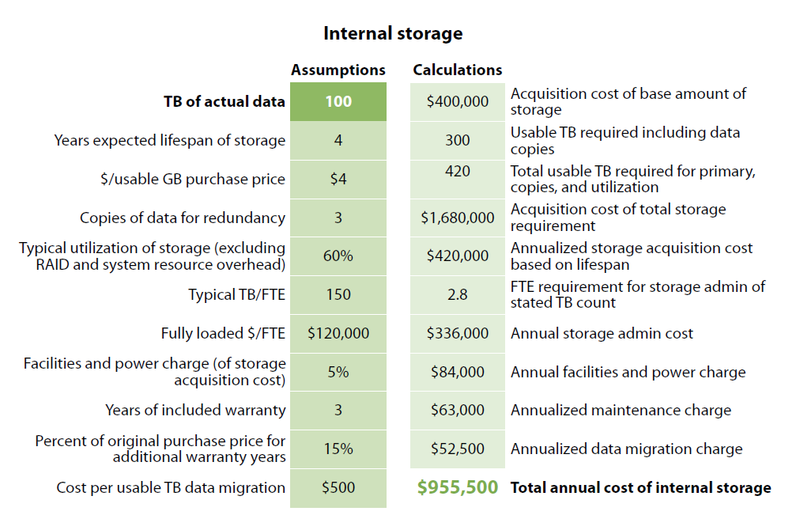 With 3 Cloud Servers for 12 months, required cost is $10,809 (If we use VM installed SQL Server) and $7,488 for use of SQL Cloud Database (SQL Cloud database). These rates are as per no-commitment Azure pricing plans. With Azure based Hosting using Pay-AS-you-GO plan we are getting net 47% and 64% savings respectively as compare to on-premise option. 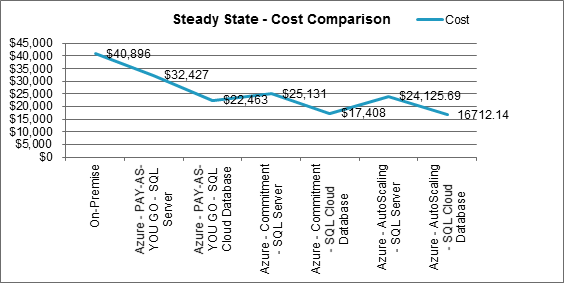 With 3 Servers in Cloud for 12 months using 6-Months Azure Commitment pricing plan, we are saving 58% (SQL Server in VM) and 71% (SQL cloud database) cost as compare to on-premise option respectively. By leveraging Auto Scaling feature, you can save up to 81% (SQL Server in VM) and 84 %( SQL cloud database) for a given sample usage/traffic scenario. For very low usage/traffic scenarios one can use Free/Shared services as part of the Azure platform such as ‘Websites’, using this will bring down cost substantially. These applications live long life may be through entire business life. Users of such kind of applications are pre-decided or known in total number. Such applications may have some spikes in between occasionally but may not cause impact of it on real business or cause of worry for IT. Although the traffic attracted by such sites is known, predictable and can be controlled. Resource requirements may vary over a period with slight spikes because of occasional increase in download or upload of information such as appraisal letters, pay-slips, media contents (audio/video), Process/Product (PDF) manuals, accounting reports, Periodical reporting etc. In below given sample scenario, we are considering an internet facing web site which will be used for 36 months period. The users of the application are known and fixed in number so this site doesn’t undergo so many spikes in un-controllable manner. For deploying this application on on-premise environment, architect of this solution has suggested to have 2 web servers in load balanced manner with 1 database server. Although load on this application doesn’t vary so much, but to sustain the anticipated smaller spikes, IT has to provision all three servers for complete period of 36 months. Since all servers are provisioned from start, this result in wastage of resources in relative low in volume, in this case because of steady state nature of this application. If we use Windows Azure Cloud platform for hosting this application, Actual Azure VMs can be provisioned and de-provisioned in response to on-going traffic as shown below which will result in cost reduction, better user experience by providing required resources to application as need be. Below graph showing how resource demand is being served cost effectively over a period. 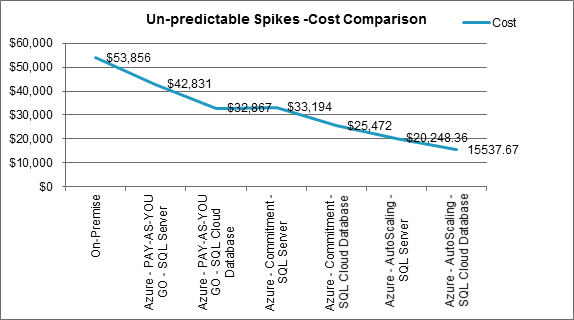 With 3 Cloud Servers for 36 months, required cost is $32,427 (If we use VM installed SQL Server) and $22,463 for use of SQL Cloud Database (SQL Azure). These rates are as per no-commitment Azure pricing plans. With Azure based hosting using Pay-AS-you-GO plan we are saving net 21% and 45% respectively. With 3 Cloud Servers for all 36 months using Azure Commitment pricing plan, we are saving 39% and 57% using SQL Server in VM and SQL cloud database usage respectively. These are long living public facing business (core) applications. Traffic attracted by such applications indicates popularity, transaction volume of your business. Customers visit such sites either for direct purchase of product or services or take part in surveys you launched or to track orders or log complaints about their orders and most importantly product enquiries or quotations. Such applications do not have liberty to perform slow, sluggish or keep users waiting for completing their intended operations. This will directly impact on your business and customer satisfaction index. These applications not only get accessed by end users browsing through the home page but also will be accessed by other means such as Search engines, analyst reports, blogs, Product reviews, Product comparison sites etc. These users are more important because they are the potential customers of yours and your site should have potential to satisfy them with performance for turning their opinions about your offerings, customer focus and IT enablement aspects. One can monitor the traffic and predict spikes in such applications with greater degree of accuracy but spikes are normally very heavy and your normal infrastructure may not be sufficient to serve your business as normal. You need to be very aggressive in handling traffic spikes and provisioning required resources during that period. Most common approach enterprises consider for this by extra provisioning IT resources which remain underutilized except the peak period leaving behind high cost of ownership, underutilized resources wasting capital investment. In below given sample scenario, we are considering an internet facing web site which will be used for 36 months period. The users of the application are not known and not in fixed in number but with appropriate traffic monitoring and experience one may predict the load pattern. For deploying this application on on-premise environment, architect of this solution has suggested to have 3 web servers in load balanced manner and 1 database server. Because load on this can be predicted with some amount of accuracy, some resources consumption can be optimized but considering business dynamics one has to be ready for un-expected case so IT has to provision all four web servers for complete period of 36 months. IT may add or remove some Servers with great care as shown in below graph. Graph shows IT has deployed 3 servers for initial 12 months, and later added one more server for rest of the 24 months. Since all four servers are procured for disaster scenarios; there is certainly loss of capital investment here. If we use Windows Azure Cloud platform for hosting this application, Actual Azure VMs can be provisioned and de-provisioned in response to on-going traffic as shown below which will result in cost reduction, better user experience by providing required resources to application. 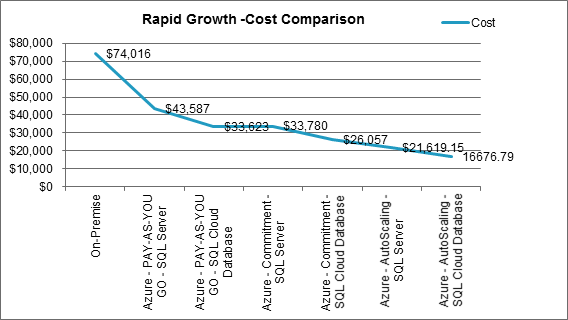 With 4 Cloud Servers for all 36 months, required cost is $42,831 (If we use VM installed SQL Server) and $32,867 for use of SQL Cloud Database (SQL Azure). These rates are as per no-commitment Azure pricing plans. With Azure based hosting using Pay-AS-you-GO plan we are getting new saving of 14% and 34% respectively. With 3 Cloud Servers for all 36 months using Azure Commitment pricing plan, we are saving 33% and 49% using SQL Server in VM and SQL cloud database usage respectively. By leveraging Auto Scaling feature, you can save up to 58% and 66% for a given sample usage/traffic scenario. Again these are long living applications having unpredicted user base and their access patterns. Even if you monitor the resource utilization over a period you will not get an idea about the usage pattern leaving behind low prediction accuracy. These are also your core business applications but based on content or nature of business you do, user access pattern remains unpredictable. It has been also found that predictions does not turn true because of number of variable parameters involved in prediction are very high or the geography your business caters is very wide. For e.g. You are a global manufacturer of some cosmetic products, such products are in demand based on population of country their ethnicity, weather conditions, sales and marketing efforts, your competitors presence, sudden goodwill by analyst reports or successful campaigns or offers which has high turnout rates. It is difficult to judge impact of all such variables on traffic ratio accurately as these variables are scoped globally. IT has very important role to play in such scenarios, enterprise cannot keep on investing new resources to sustain every possible spike found high for current infrastructure. Such high capital investment cannot be justified in terms of their outcomes and utilization over a period. IT cannot use these resources for other business scenarios and take risk of losing users/customers. Such underutilized resources sometimes applies breaks in progress in new IT initiatives which can benefit business where organization does not see value because of lack of IT innovation in other areas where wastage is happening. In below given sample scenario, we are considering an internet facing web site which will be used for 36 months period. The users of the application are not known and not fixed in number so this site may undergo any number of spikes in un-controllable form. For deploying this application on on-premise environment, we have considered 3 web servers in load balanced manner with 1 Database server. Because load on this application may vary to greater extent, IT has to provision all four web servers for complete period of 36 months. Since average utilization of servers may remain low, this may result in wastage of resources in relative high in nature in this case because of unpredictable state of this application. Windows Azure Cloud platform is ideal for such kind of applications providing complete elasticity and high scalability and availability. 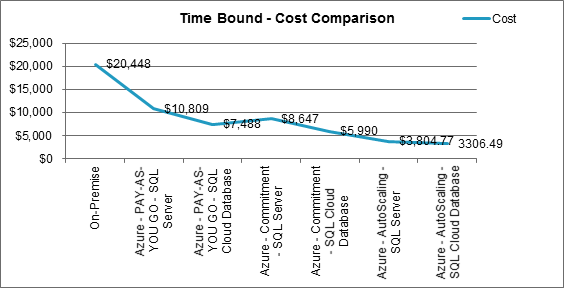 With 4 Cloud Servers for all 36 months, required cost is $42,831 (If we use VM installed SQL Server) and $32,867 for use of SQL Cloud Database (SQL Azure). These rates are as per no-commitment Azure pricing plans. With Azure based hosting using Pay-AS-you-GO plan we are saving net 20% and 39% cost respectively. With 3 Cloud Servers for all 36 months using Azure Commitment pricing plan, we are saving 38% and 52% using SQL Server in VM and SQL cloud database usage respectively. By leveraging Auto Scaling feature, you can save up to 62% and 71% for a given sample usage/traffic scenario. This type of applications become popular day by day and continuously attracts traffic. Normally this happens with successful startups or with companies launching new innovative ideas. Although, we know that site is doing good we can’t predict what will be the rate of progress and anticipated resource requirements of it. Since it’s highly impossible to predict the traffic and resource need, you need a flexible resource model to provide consistent user experience. Long delays in procuring server(s) can hamper your business and you may start losing users. Aggressively provisioning resources in anticipation is also not suggested as it might prove bad capital investment. In below given sample scenario, we are considering an internet facing web site which will be used for 36 months period. The users of the application are not known but are continuously increasing; site may grow and become uncontrollable very quickly if resource requirements are not well coped with. For deploying this application in on-premise environment, we have considered 4 web servers in load balanced manner with 1 Database server. Because load on this application will grow constantly but without knowing the actual rate, IT has to provision all 5 web servers for complete period of 36 months. Since there is some idea that not all four web servers will be needed for total period, IT has procured 3 web servers initially and 1 web server in 16th month as shown in graph below. Since we don’t know the rate of traffic increase, there is always risk of underutilized and over utilized servers if you procure in advance or be pessimistic and wait of the day. Windows Azure Cloud platform is ideal for such kind of applications providing complete elasticity and high scalability and availability. With 4 Cloud Servers for all 36 months, required cost is $43,587 (If we use VM installed SQL Server) and $33,623 for use of SQL Cloud Database (SQL Azure). These rates are as per no-commitment Azure pricing plans. With Azure based hosting using Pay-AS-you-GO plan we are saving net 41% and 55% cost respectively. With 3 Cloud Servers for all 36 months using Azure Commitment pricing plan, we are saving 54% and 65% using SQL Server in VM and SQL cloud database usage respectively. By leveraging Auto Scaling feature, you can save up to 71% and 77% for a given sample usage/traffic scenario. Friends! I hope this analysis will help you understand the Cloud Usage scenarios, different Web Application patterns and associated cost savings as compared to on-premise deployment. Please let me know if you are interested in knowing further details of above calculations. Just express your will by putting ‘Comment’ against this article, I will share every bit of information with you. Quality posts is the secret to invite the users to go to see the site, that’s what this web page is providing. Also, thans for allowing me to comment!